If big family meals have been served in your house over the last several months, like me you’ve probably run out of ideas for polishing off the many dishes of leftovers piling up in the refrigerator. I am guilty of forcing my family to eat “deja vu meals”… those endless repeats of the same old plates filled with the same old food. Now Dad may be fine filling his lunch box with yet another turkey sandwich and Grandpa may be alright with piling some stuffing on a plate and covering it with gravy once again, but the rest of the family is getting a bit worn out. It’s time for several somewhat more creative ways of using up what’s been staring at us from those refrigerator shelves. The idea here is to create something that tastes different out of something very familiar. Eating a plate of turkey, stuffing, green bean casserole, sweet potatoes, cauliflower, and cranberry relish is nostalgic the first time. The second or third time, a plate like that is boring at the least. Chances are you’ll be throwing out food if you try to present that same plate a third time. The trick to creating a new dish is to think about what ingredients you are working with, not just the finished dish. Let’s see if we can’t come up with meals that appeal, not just another plate of leftovers. 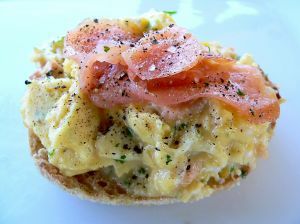 A little surprise egg dish for breakfast is always appreciated by a busy family. Try this satisfying combination on a cold, wintry morning. Spray a muffin tin with non-stick spray or brush with butter or oil. Spoon enough stuffing in each muffin cup to form a little dish by pressing stuffing into muffin cup and up the sides, leaving enough room for one egg. Break one egg into each cup and top with enough shredded cheese, either cheddar or Parmesan, to cover the egg. Pop the muffin tin in the oven at 350 degrees for about 15 to 20 minutes or until the egg is done and cheese is melted and golden brown. Let the muffin tin stand a few minutes before removing the egg dish. Breakfast is ready. Serve with just a dab of some leftover cranberry relish for a bright addition of flavor. No more leftover stuffing. 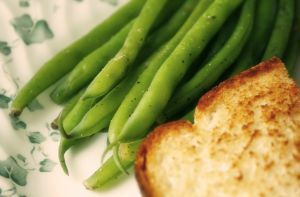 The problem with recreating most vegetable side dishes is that recooking the dish will usually result in a mushy entree. That’s why I like to turn most vegetable dishes into creamy soups. The classic green bean casserole already has the cream of mushroom soup and cheese in the ingredients so it’s perfect for a cheesy soup. Green beans wouldn’t be enough to carry a cheesy soup, so let’s add some nice diced tomatoes to perk it up a bit. Start with a big soup pot and saute some nice big chunks of celery. Then add some big diced pieces of onion. Cook until just transparent. I recommend a clove or two of garlic, stirred into the onions at the last moment. Now pour in one can of fire roasted diced tomatoes. If you don’t have fire roasted tomatoes, you might want to add just a sprinkle of any good grill seasoning or dry rub seasoning that you like. Now add your leftover green bean casserole a little at a time, stirring and heating through until you get the right soup consistency. Add a little chicken broth if you need to thin out the soup. Simmer until all the flavors are nice and savory together. No more leftover green bean casserole. You’re in luck if you have leftover mashed potatoes. Leftover mashed potatoes or potato casseroles make a fabulous thick and creamy soup. Why? Because you’ve got most of what you need right there for the basic soup. You’ll want to add several other ingredients though. Start with a big soup pot. Put three or four slices of bacon, diced up, in the pot and cook until just crispy and remove. In the bacon drippings, saute some diced celery and carrots until soft. Then add some diced onion and saute until transparent. In the same pan, make a thin white sauce or roux for thickening. A thin white sauce should be about 1 tablespoon butter or oil, 1 tablespoon flour, and 1 1/2 cups milk, simmer until just starting to thicken. Then add your leftover potatoes a little bit at a time until it has the consistency of creamy potato soup. Top with the bacon, stir gently and let it all simmer together slowly. Top with a pat of butter, some paprika, or even some shredded cheese. 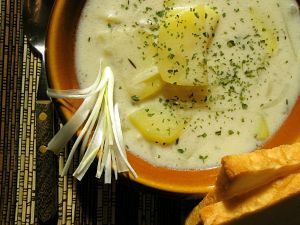 You now have a nice, flavorful and creamy Potato Soup. No more leftover mashed potatoes. 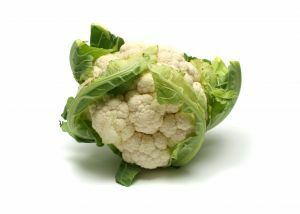 We make a fabulous curried cauliflower vegetable dish which happens to make the perfect soup base. Here’s how. In your food processor, put the leftover curried cauliflower. Pulse until cauliflower is nice and smooth, adding a bit of milk as you go. If you don’t have curried cauliflower, just use leftover cooked cauliflower and simply add about two teaspoons of curry, more or less to taste, to the cauliflower when you put it in the food processor. In a soup pot, saute some diced carrots and onion if you wish. Then pour the smooth cauliflower in soup pot. Cut up or shred leftover turkey and add pieces to the soup pot. Let soup simmer until nice and cooked through and hot. Add a bit more curry if desired. No more leftover turkey and cauliflower. Using up two items on your refrigerator shelves in a new and unexpected way is a sure family pleaser, and an incredible way to disguise leftovers. Start with some turkey, both white meat and dark will do, cut up fine or fork-shred. In a large skillet, brown a little diced up bacon. This will give your dish a smoky flavor. Add some diced onion and minced garlic if you like. Put the cut up turkey in the skillet and top with enough leftover gravy to make the turkey pieces swim just a little. Now scrounge through your pantry and find a good barbeque sauce or grill flavoring or dry rub. Flavor your gravy and turkey mix with just enough of the sauce or rub to give it that Sloppy Joe flavor. You’ve made a unique sloppy sandwich on a bun meal. No more leftover turkey and gravy. These are just a few of the ways to recreate your leftovers so that your family isn’t staring at the same plate repeatedly for days. Give some thought to what ingredients went into each dish, and where you’ve seen those ingredients together before. Chances are you’ll come up with a few unique meals of your very own.